I have approx. 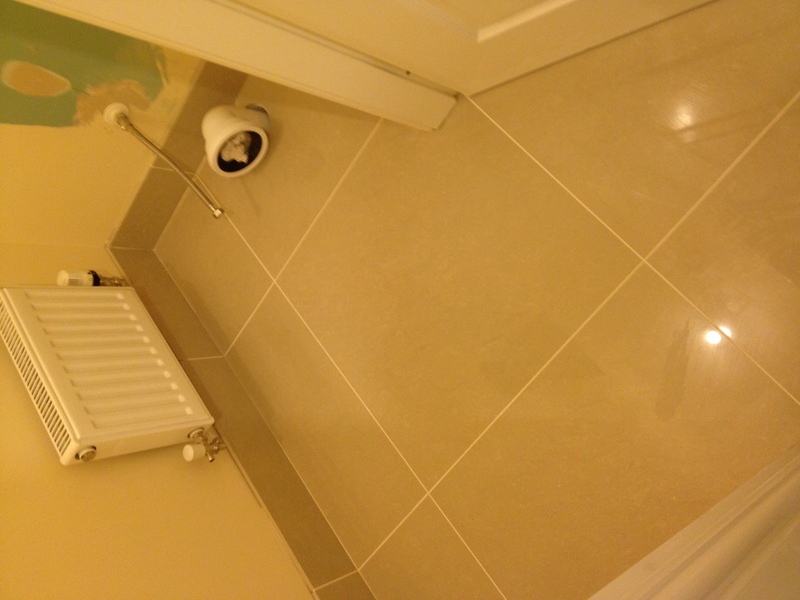 50 sq m of floor tiling with no skirting, approx. 25-30 linear metres. This is ground floor including a WC and utility but not bathroom type wet environments, although she does like to mop the floors a lot. Sticking stuff to a wall whilst still being supported by the floor seems like something that just might be within my skill set but I have a few questions. 1) These are 600x600 9mm thick, concrete grey, porcelain tiles, am I likely to be able to a good enough cut edge to just cut the tiles into strips to use or should I only use the existing 4 finished edges? 2) I was thinking of using 100mm high. Sound right? 3) I’m going to need a cutter for these and as I have no other tiling to do, hiring may be more cost effective. What is a recommended cutter for large format tiles to get a good edge along the complete length every time? Butts not mitres at corners. 4) What’s the preferred technique? Just butter them and stick them on? Will use a reputable ready mix for this to save me the hassle of mixing on the job. I think I’ll need a 15-20mm depth in some spots so may need to use a bit more adhesive to fully fill the gap and paint the tops. I would use tile spacers under the strips and between them. I would try to match up with the floor grout lines even though that will be more work. 5) Grout or sealant in the gap between floor and upstand? I was going to grout. I have a wet tile cutter, the thing that looks like a saw bench but has as diamond cutting disk that runs in a water bath. I bought it VERY cheap from one of the DIY sheds years ago. It gives a very clean very straight cut to tiles, and I have even been using it to cut the valley tiles on my roof. If you can find one, then it will do what you want. It was so cheap to buy I wouldn't mess about hiring one. Best to use it outdoors though as it'a a messy thing to use. I have used one in the past on thin ceramics with good results but the thought of cutting 30m of porcelain tile with one is very off putting. Hire a good quality Sigma or Rubi clinker ( scribe and snap ) cutter and they'll cut in seconds. Nice and straight too. Use a trim on top to cover the fact that it's a cut edge and get more cuts per tile. A cheap cutter will just give curved ( concave / convex ) cuts so don't bother with those. For lots of complex cuts or finished stuff that's on show ( big floors etc ) I take a pallet to my local water jet ( engineering ) shop and they cut them better than the factory does. You shouldn't need more accuracy than the clinker cutter tbh Dai. I shall make enquiries to see if anywhere local hires such a beast. A bit of practice (and there's loads of offcuts to go at) will give me more than enough accuracy. I have an Erbauer wet tile cutter and it is fine. 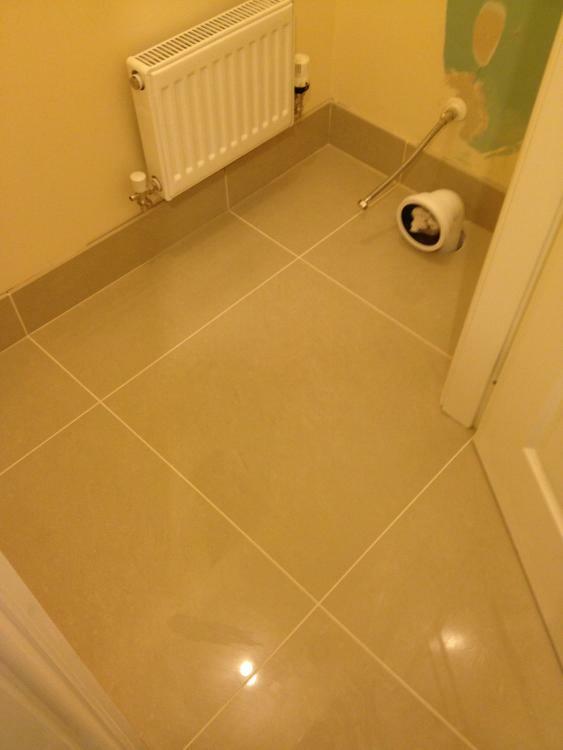 Cost just under £100, and has now done 4 rooms with porcelain tiles. i would not be daunted by the 30m of cuts; you will have to do almost that amount around the edges anyway. For me the laser line on that is a waste of space, and I just use it with the top guard off - the main problem is that you can get very wet that way. I would not use the edges exposed at the top of a skirting, because with porcelain tiles there is always minimal chipping - though others may know better. For your setup I would only used the original edges at the top, or possibly get "string" type tiles for a row along the top to give a highlight. Height of skirting is a design choice, but with those big tiles I would draw up the layout so you can get your skirting out of the cut tiles round the edge. I think the "cut tiles into strips" thing will use more tiles, not less. If you work symmetrically and the edge tiles are all under 400mm, by definition you have your full 150mm skirting from the offcuts with a manufactured edge and without buying any more, since by definition there is almost exactly the same length of skirting as floor edge. Technique - I would do the skirting after the other has set. Ferdinand, thanks for the input but I think you have mis-understood that the floor has not been laid. It has been down for some time and I have a fair amount of off cuts and full tiles left over I plan on using instead of a MDF skirting board. Such is the house, I currently increasing the wooden boards from 70mm to 120mm so I think 100mm or so for the tiles will be tall enough. it does not seem so easy to hire a decent manual tile cutter. Having a looking this morning, this was one of the few options http://www.we-hire.com/decorating.html A large MAC (Macallister, ffs...) I don't think so and a bigger thing at £40+VAT +god knows what other charges for a couple of days. The 900mm one or the 600mm one AFTER it ( not the 600mm one before it as that's a POS ) seem good cutters and the 900 is £36 a week. Go get that and crack on. Take a tile or two with you when you go pick it up and ask them to demo it. The secret is to lightly score the tile but the most important thing is to make sure you score 100% of the tile face, eg don't start 3-5mm in and go light at the very end or you'll end up with carpet knife shaped cuts ( straight all the way and a swerve at the very end ). Youll do yourself a favour if you have a small grinder with a non grooved ( continuous surfaced ) diamond disc in it to clean off any snots. Safety specs is absolute critical as porcelain shards are quite painfully in the eye, I sh1t you not. Mid the cutter has a locking mechanism to keep the tile at 90o to the cut then don't assume it's spot on. Put the tip of the cutter on the tile and mark where it lands. Rotate the tile and do the same again. Then use a known square to check that it's cutting at 90o, as you may be doing PARALLEL cuts but the perps won't be parallel if not and you'll see that if you've a 2-3mm grout line. As my bathroom is left needing some plastering (and some Tiling in the future), I being forced to turn my attention back to this. this is an example of what my wife is expecting albeit on a granite floor. She he doesn't want a trim along the top, just the gap filled and a fillet to join to the wall. Looks like a silicon fillet in those pics and a bit rough too in places? Nick will be along shortly, hang in there! theu don't seem to do mirror smooth plaster in Greece. It's all some sort of roughish internal render that's thickly painted to soften it a little. And I'm also wondering how well to fill the gaps I have at the edges. Just a a bit of foam before adding my tiles or foam and some some of sealant before the tiles. tempted to use no more nails to stick them as I'm sure this will need plastering in the medium term. 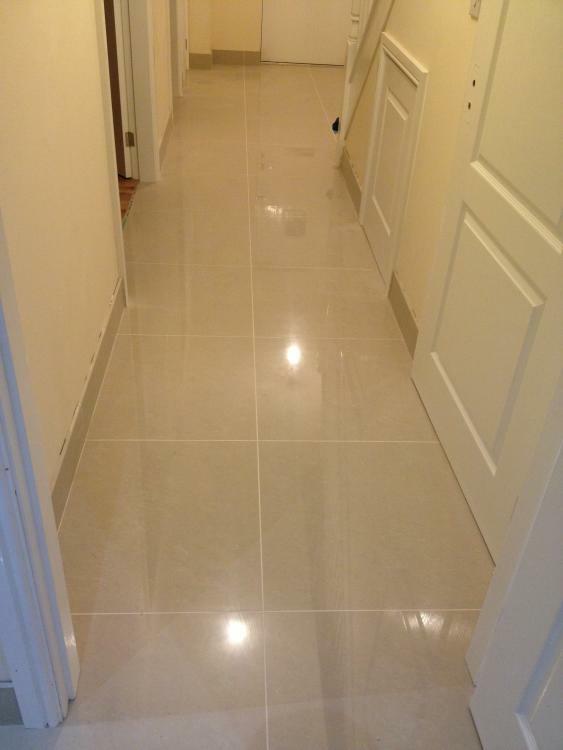 Are you tiling the floor first? Hope so. This was in my mates brand new Persimmon home. 13 bags of self leveller needed over a new liquid screed.....WTF. 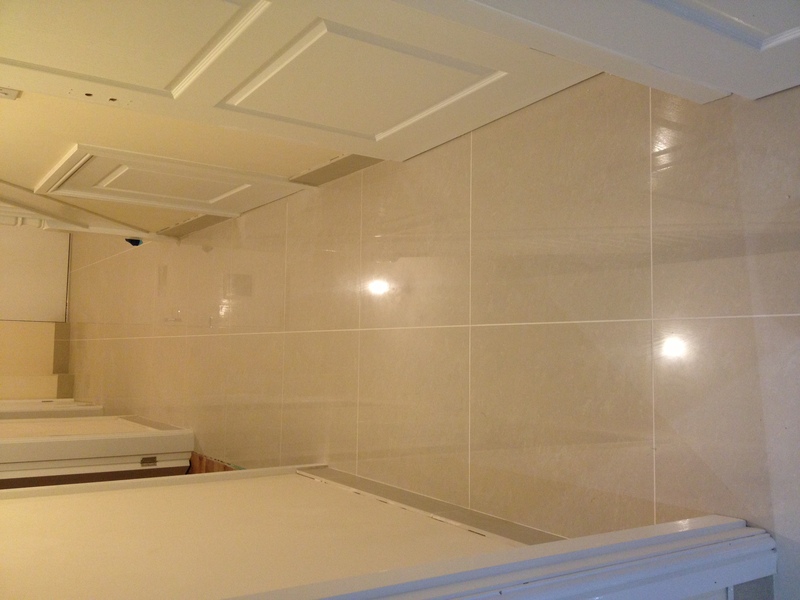 Stick the skirting tiles on with slow set powder tile adhesive. Use a straight edge to keep them as straight as possible, and a boat level to keep them vertical. Put insulation tape on the top edge of the tile as masking, and to stop your filler knife marking the tile, and use a hard filler to put a 90o edge between the tile and the wall. When you come to plaster, you'll then have a slight gap 3-5mm at accept the skim without encroaching on the top edge of the tile. Fwiw, tiled skirting all the way for me. ? Won't that get hit by mops and hoovers? What about a render skirting? I don't know what that is and am Unlikely to be able to do it. will allow me to work methodically without rushing rather than hiring a clinker. on the other queries, just squirt of foam to fill gaps to stop spiders and big draughts etc? That cutter is a good for the money, my blade cost £40 ! If you foam first, don't forget to mask up anything you don't want it to get on. I'd just fill the gaps with adhesive as I went tbh, no waiting, no cutting back excess foam etc and will add to the bond. Sorry to hijack but if you don't mind Nick I'll post up a pic of the BIG tiler cutter I've been given recently. As yet unused in anger but I'd appreciate your professional opinion. 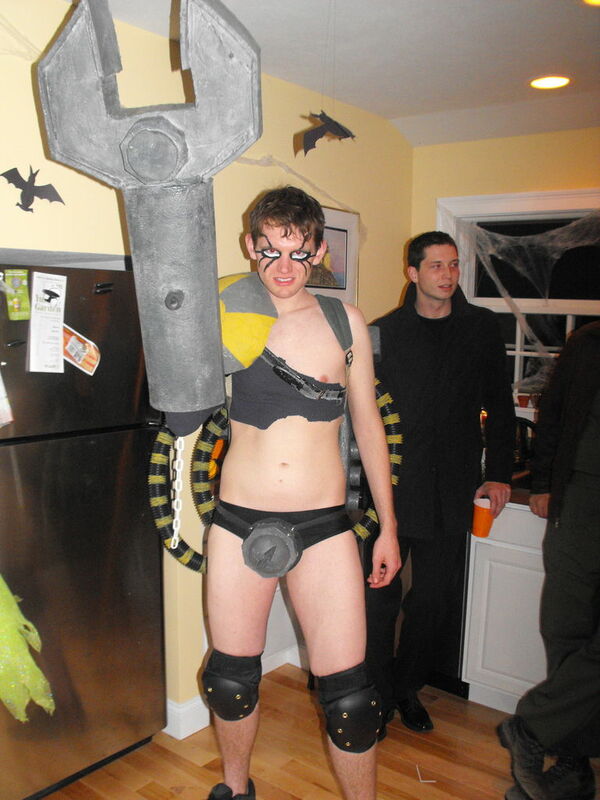 If daiking was nearer he could borrow it.